Observations on Steve Job's legacy - and Apple's leadership future - are only just beginning. 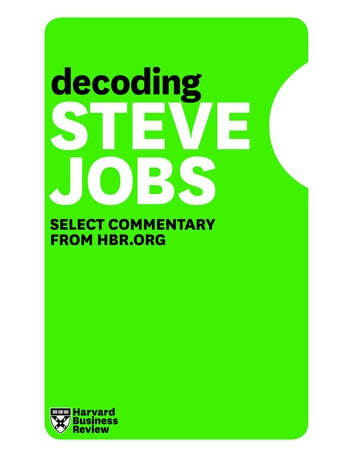 In recent years, many leading thinkers have contributed their thoughts on the Jobs phenomenon on HBR.org. We've compiled a few of the most insightful here, and we invite you to read them through the lens of business lessons to be learned. We've selected six pieces: two from after Jobs's August 2011 retirement and four from before. We hope you will enjoy them, learn from them, and continue to turn to HBR.org for ideas and inspiration. THE TEAM CODE. Leadership & Team Development Basics. Special Team Building Activities Included. Organize Your Day In One Hour: Proven Ways To Hack Your Productivity, Manage Priorities And Get Things Done! Why You Need a Career Coach and a Mentor! Leadership Development: If Steve Jobs Was Coaching You - Charismatic Leadership Lessons Borrowed from Steve Jobs for High Potential People and Leaders. Performance Management: 30 Ways To Improve Performance At Work And Personal Life - Second Edition!